Senate President Stephen Sweeney remains one of the leading proponents of a $15 minimum wage, and with the election of Gov. Phil Murphy, New Jersey could well be the next state to enact it. On Wednesday, however, Sweeney was urging caution, saying there will have to be exemptions to any $15-an-hour law in New Jersey. To be clear, the Senate President is not changing his position. He supports raising New Jersey’s minimum wage to $15 an hour, but making a jump as large as this should be done cautiously. “When you’re going to go to $15 an hour, it has to be done with a lot of thought and with precision,” he said. “You don’t want to create a situation where there’s a large reduction in employment. “There has to be exemptions. I’m really concerned about small businesses, like the bagel shop owner with three employees,” Sweeney said. Sweeney was speaking before more than 100 business leaders at Meet the Decision Makers on May 16, hosted by NJBIA and the NJ State Chamber of Commerce. He also discussed the budget and taxes, education, higher education and other issues in an hourlong session. On minimum wage, he urged business to take a constructive approach instead of just opposing a minimum wage increase. He said he wanted to work with the business community in developing the legislation. In addition to small businesses, Sweeney said he was concerned about what to do with companies that have government contracts, because they are locked in and cannot raise prices to cover higher wages. Ideas under discussion include having a separate training wage and lower wages for teenage workers. 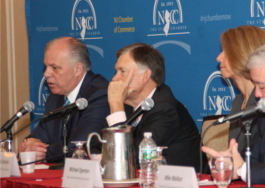 NJBIA has been advocating for exemptions to mitigate the impacts of a minimum wage increase on small business, particularly in various sectors. An Op-Ed on NJBIA’s approach to the $15 minimum wage can be found here. I just wish government would let business and the free market determine wages. When unemployment is low and there are not enough workers or neighboring states offer more per hour it seems wages would naturally rise on their own. Why is this needed? Just another crazy government idea to drive employers out of the state. When they did this in Seatle the $15 wage actually drove down employment. What makes NJ government think it’s not going to happen here too. The real key to getting people out of the working poor state is to change all those regulations that penalize the working poor like the one that takes away all support if they get a small raise. You also have to take the handcuffs off the economy in NJ and let businesses grow and create better jobs. I agree. I have an employee that would have to go down to part time at my small business. She makes $14/hr now and qualifies for state healthcare. $15/hr would disqualify her from that, (and vacations and paid holidays) and cost her the same $6000 per year that we pay. Considering NJ says it wants to be competitive with its surrounding states, they need to balance its taxes & fees, which are already impacting small businesses, with any proposed increase. Unfortunately NJ representatives have never been known to be deep thinkers. They forget decisions can become domino chips, having unintended & adverse affects to their purported goals. Entry level jobs require entry level wages. The minimum is and was set to protect against abuse. Not to pay a mortgage, have the highest quality iPhone, nice car, etc. I got three jobs in my youth when I needed more money. There needs to be a delineation between the two. I hire high school students or folks who have not had a job, OR are in drug recovery programs. They bring no tangible skill set to my business or have issues. I hire them for moral compass and personality. Most cannot sweep a floor properly. All of these situations come with a price to the employer. Having a food environment, I have little control over so many costs and take the hit on my profit every time there are increases. It will get to the point it won’t be worth the investment, risk, amount of work, etc. If I can only make the same as a manager, why would I take all the risks and workload as a small business? I have 20 employees because I hire a lot of high school students to offer them flexibility to be on a team, go to prom, take off here and there and do well in school. I get penalized for managing all of this??? My second location IS NOT NJ for all of the reasons and the biggest one is this issue. Paying teenagers a lower wage because they are teenagers sounds like age discrimination to me. So an adult working at McDonald’s gets paid $15/hr and a teenager makes $8 for the same job? How is that fair? Couldn’t agree with you more. You hit it right on! I’m sure it won’t fly but Corzine tried giving $3000 credits I believe to hire new employees. He wanted to see more people working not so much higher wages. Maybe they can tie wage increases to some business tax incentives/credits. The bagel shop owner with three employees is likely not paying payroll taxes, workers comp insurnace and the like. They likely are paying cash anyway like most mom and pop’s that continually steal from legitimate employers. The service industry will die, as they are already with the lower unemployment rates and minimal margins. Maybe lowering property taxes and taking on the teachers union which comprises nearly three quarters of our property tax bills would be a better alternative. I don’t see New Jersey students excelling nationally. It doesn’t seem we are getting a good return for our tax dollars. The southeast just gets better looking with every hairball (I mean legislative act) coming out of our NJ State legislature. I have 130 employees, ship products around the world, and I am running out of reasons to keep my company in NJ! Paid sick leave, $15/hr minimum wage, potential of pay discrimination lawsuits, NJ State worker pay increases this year, powerful unions and underfunded pensions, some of the highest property taxes in the country, a new governor who pillaged on Wall Street to bank his fortune and could really care less about local business (as his agenda demonstrates), and the list goes on and on. This is not going to end well for NJ. Just one more reason why if you are a senior you can no longer afford to live in a state with the highest taxes in the nation, non stop spending, a governor who thinks nothing of giving across the board raises with no justification as to where the money pot of gold is, adding another level to our out of control gambling revenue, pensions which will drain the bank and so on it goes and us living worst off than if we were on welfare left with one option being forced to exit the state of NJ. I agree that $15.00 an hour may be too much, but $8.65 is too low in a State with the highest property taxes in the nation.